When life gets tough, just love it a bit harder. For fans of John Green, Rainbow Rowell, and Jojo Moyes: a beautiful, funny novel about loving life and everything in-between. Abigail Mitchell wants the world. She wants the guy she’s falling for to love her back, the great job in the city and a place of her own, far – very far – from her parents. But in real life, Abby tries to make money from a job she absolutely loathes, keeps hopelessly falling for Mister Wrong and still lives at home with her parents. Life couldn’t get worse if she tried. Yet when things do get worse one day of May, Abby knows she’ll have to pull herself together if she ever wants to find the one thing she needs more than the world. Heart-warming and sometimes heart-breaking, Abby’s story shows how stumbling your way through life can help you find happiness even in the most unexpected ways. 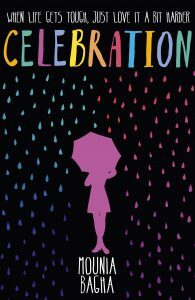 Celebration is a book where fiction meets self-development in a series of relatable anecdotes that will make you feel in good company. But above all, it’s an optimistic tale about ending the self-sabotage we all seem to indulge in so easily when disillusions and heartaches come our way and choosing to heal ourselves back to life again instead. Mounia has done an amazing job on this book. She is an author to watch! Celebration is cheeky, fun, and a rollercoaster of emotions with romance. A reminder to live life! With Abby, Mounia Bagha creates a totally relatable character who is just searching for her identity. The first paragraph already made me want to continue reading the whole story. The writer has a catchy way of telling. All the details make you feel being part of the story. I highly recommend this story to young women to confirm to live their dreams! The book was great! Writing from the soul, the author must have been inspired by events much like what she wrote about because as I read the words on the page, I could feel myself in those same situations. I loved it! I liked that the main character was a woman and that it all sounded so real. It was a pleasure to read it. Still Not Sure? Give It A Try. Get The First Four Chapters. Get started on your reading and find out if Abby's story resonates with you before spending any money. Get the most out of your reading experience with this extra bonus. Want a hint? This one is all about you! Get The Weekly Tales Newsletter. Tales about love, life, and all the WTF in-between because you are never as lonely as you think.